In celebration of the seaside, we’ve created a new bouquet with our favorite seasonal colors in mind. Billowy blue hydrangea blossoms, white cremons, white alstroemeria, and green hypericum berries create a perfectly pretty palette. 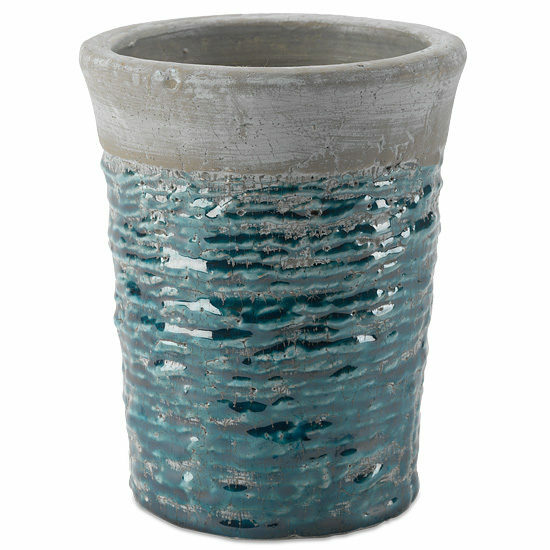 The bouquet has a very natural appeal when allowed to spread out in our beautiful, yet casual, stoneware vase. Our vase’s cement-like feel and ridged texture reflect a glaze of stunning aquamarine, giving it a unique shine and fluid look reminiscent of the ocean tide. Remove all foliage that will fall below the water line. Cut stems to the appropriate length of your container or vase. Do not be afraid to cut! Hydrangeas may look a bit tired upon arrival. Don’t despair! They’re healthy, just thirsty. They will rehydrate and perk up within 24 hours. IMPORTANT! Always add fresh water daily. Change water and recut stems every other day.